An example of the Wachbataillon cap tally worn on the service caps of enlisted sailors of the Naval Company of the unit. The primary mission of the Wachbataillon is performing military honors for the President of Germany, the Chancellor of Germany, the Federal Minister of Defense and the Inspector General of the Bundeswehr during state visits or on other significant occasions. Most celebrated of its honors is the Großer Zapfenstreich (Salute to the Colors). 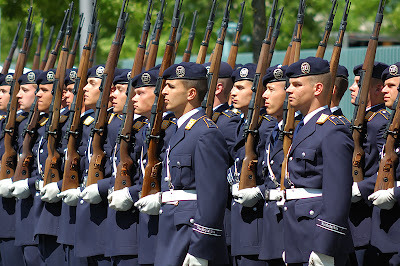 Beside executing military honors for government officials the Wachbataillon also takes part in other national and international events such as the ceremonial oath of the Bundeswehr, parades, military reviews and shows with its drill team which is the best trained special unit of the battalion. Other missions of the Wachbataillon included performing the ceremonial guard duty of the Ministry of Defense and other high profile public places as well as providing security to members of the German government and Ministry of Defense. An additional secondary mission is securing and defending the alternate seat of the federal German government in conjunction with forces of the Federal Police in the event of direct attack on German soil, which posed an ever looming threat on the West German capital of Bonn during the Cold War. The uniform displayed here is the uniform of an Enlisted soldier's Grundform des Dienstanzugs Luftwaffe (Basic Service Uniform of the Air Force) for Luftwaffe Gefreiter (Airman). The uniform jacket depicted is of the standard Air Force blue color with the yellow gold colored piping of the Air Force adorning the shoulder boards and collar insignia. Wachbataillon uniforms are usually made of different material than standard Bundeswehr uniforms due to their high visibility status. Headwear for the Wachbataillon units generally depends on the ceremony in which they are performing. The usual headgear that would accompany this uniform would be a dark blue Luftwaffe beret with a metal insignia of the Wachbataillon depicting a Gothic 'W' inside of a wreath. A close up view of the Wachbataillon berettabzeichen (beret insignia) worn upon the dark blue Luftwaffe service members beret. A substitute would be a dark colored helmet typically worn during the execution of the ceremonial Großer Zapfenstreich (Salute to the Colors). The right side of the uniform displays the embroidered wings emblem of the Luftwaffe, signifying the branch of service. The brustenhänger (pocket badge) designates the wearer's current status as being assigned to the Wachbataillon. For ceremonial duties, the unit title is also embroidered in Wachbataillon cuff titles on the jacket sleeves. All service branches wear similar Wachbataillon cuff titles on their uniforms. On the shoulder epaulettes, is a single metal stripe of a Gefreiter (Airman) signifying that the soldier has completed three months of federal service in the Bundeswehr. Selection for the Wachbataillon takes place when the person is a new recruit. Training for the recruits to the Battalion is slightly different than for a recruit in other units with much emphasis place on perfect performance during drill and ceremony. Also of wear for the unit's ceremonial duties is the white ceremonial parade belt with 'Sam Browne' cross strap. It is usually worn in conjunction with white gloves for execution of ceremonial functions and bears the German federal eagle with the words 'Einigkeit, Recht, Freiheit' (Unity, Justice, Freedom) which is taken from the German national anthem. 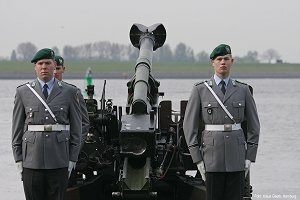 Due to its unique mission the Wachbataillon was given a special designation exempting it from Traditionserlass (Tradition Decree) which regulates the honors and traditions which are incorporated into the German Armed Forces. With it's exemption, the Wachbataillon is the only unit of the Bundeswehr still using the Mauser Karabiner 98k bolt action rifle because the traditional Prussian rifle drills can be executed better with the historical weapon. In 1995 remaining Swastikas and other Nazi-era markings were removed from these rifles, after sharp criticism by the SPD parliamentary party regarding the presence of such symbols on Wachbataillon equipment. Also with it's exemption the Wachbataillon has been deemed as the successor unit to the 1. Garde-Regiment zu Fuß (1st Foot Guards) an infantry regiment of the Royal Prussian Army activated in 1806. The Wachbataillon is also successor of the Weimar Republic Reichswehr (Armed Forces) Infanterie Regiment 9 Potsdam (9th Infantry Regiment Potsdam) which was replaced the 1st Foot Guards in 1919. The significance of this unit to modern Germany history is the fact that 19 of its officers (or former officers) were involved the in conspiracy to assassinate Adolf Hitler, by far more than any other German military regiment. Most of them were executed or committed suicide after the failure of July 20th assassination plot. The Großer Zapfenstreich usually takes place in the evening hours and consists of a military formation of at least one military band, two platoons of armed infantrymen, and two lines of soldiers carrying torches, in total about 400 men. 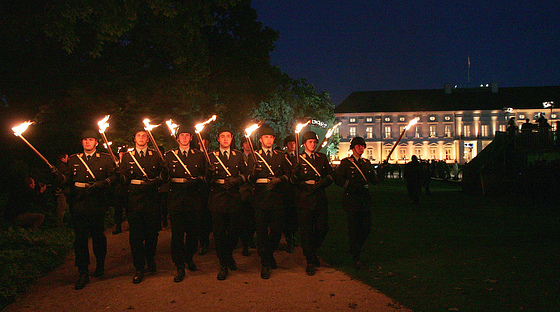 It is performed only on special occasion such as national celebrations and solemn public commemorations, to honour distinguished persons at such special events as the leave-taking ceremony for a German federal president, and at the conclusion of large military exercises.The Großer Zapfenstreich is the highest honor that the German Federal Armed Forces can render to a civilian. One of the most impressive was the performance for Allied troops leaving Berlin in 1994. Here is shown the Bundeswehr Wachbataillon performing the Marsch des Yorckschen Korps (March of the York Army) during the ceremonial Großer Zapfenstreich.